Public relations staff outnumber journalists eight to one and public organisations are spending more than ever on getting their message out. But is the rise in ‘‘communications’’ damaging our democracy or is it just another way for the public to be informed? Tim Miller reports. The number of communications staff at southern councils and publicly-funded institutions has risen rapidly in the past five years. Some say this is not necessarily bad but it can lead to more barriers stopping information reaching the public. Figures released by 13 public organisations based in Otago and Southland show the number of people employed in communications roles has increased by nearly 46% since 2014. Media management and engagement does not come cheap: $9.65 million was spent by those organisations last year, up from $6.68 million in 2014. The increase is mirrored across the country. Each organisation defines communications differently, and staff can be responsible for everything from fielding questions from journalists to publishing internal newsletters and providing information during emergencies. Others also combine their marketing and communications teams. Sizes of the communications teams also differ, ranging from 20 communications and engagement staff at the Otago Regional Council to one communications co-ordinator at the Clutha District Council. University of Otago communications director Megan McPherson said the role of the 13 communication staff at the university was varied and covered a range of responsibilities. As well as liaising with journalists, staff work on publications, internal newsletters and alumni communications, Mrs McPherson said. Communicating research findings to the public also made up a sizeable proportion of the university's media profile. From July 1, 2017 to June 30, 2018 the university featured in more than 27,000 reports, including health, science, humanities and business coverage, in the media, she said. Staff were also called upon during emergency situations, such as providing public health messages to students for meningitis and suspected water contamination, she said. The recent increase in staff was due to the added scope of the communications department, changing needs of the university's audience and increased capital development work. Production, print and postage cost for several publications were also now included in the communications budget, Mrs McPherson said. Media commentator, and former editor-in-chief of The New Zealand Herald, Gavin Ellis said there was no problem with public organisations promoting themselves and publicising information which otherwise might not be available. But often it meant more ''bricks in the wall'' between journalists and representatives and officials which was detrimental to a democratic society, he said. ''It is a matter of the purpose to what those people are put - if they are there to act as a barrier that is inherently wrong. It was increasingly difficult for journalists to get to talk to officials and often the only way questions were answered was if they were sent in an email, Dr Ellis said. Journalists and news organisations also had a role to play in making sure the public knew how information was or was not being accessed. 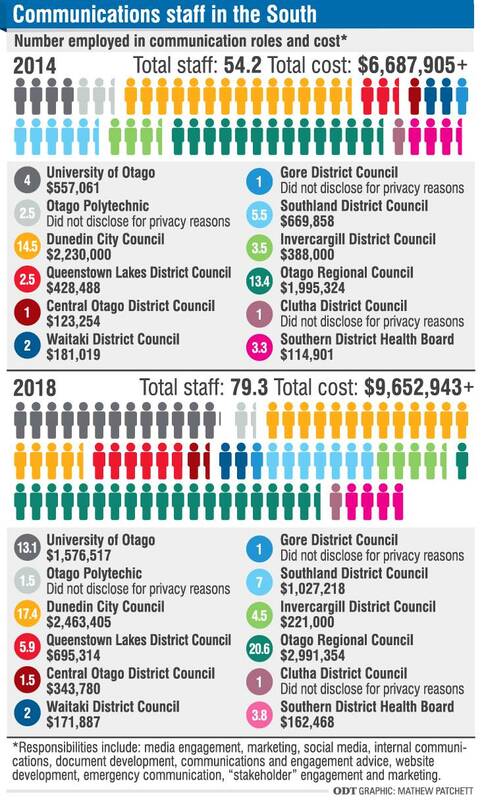 Organisations such as the Dunedin City Council, which still regularly releases a list of phone numbers for their managers and senior staff, should be congratulated and encouraged, Dr Ellis said. Massey University senior lecturer in communication, journalism and marketing Catherine Strong said public relations staff played a vital role in informing the public. But there were also now eight public relation specialists for every journalist in the country which meant there were now more people trying to ''fine tune'' information before it reached the public. When information was controversial or there were two sides to a story, raw information was much harder to come by, Dr Strong said. There was a ''huge'' role for good public relations in local government because there was more and more information which was significant to the public, which would not usually come out otherwise, she said. One council which has increased its communication and engagement staff in the past year in an effort to better inform the public is the Otago Regional Council. In September, the council advertised eight new jobs in its communications department. Council stakeholder engagement director Sian Sutton, who has since left the council, said the hires were a reaction to failings by the council communicating with the public. Farmers were not aware of council policies and systems, and there had been no real management of communicating with the public about public transport issues, a situation she described at the time as ''a real risk'' for the organisation. Emailed a manager at the ORC in early November, offering to send photographic evidence of faulty infrastructure. Still waiting a reply from them or one of the 20.6 communications staff. The rise of the spin doctors. Well done ODT, Good reporting. The thing that really annoys me is the little DCC FYI booklet that the council produce and get hand delivered to every home. How much does that cost the ratepayer? Not only is it blatantly a self promoting, electioneering and propaganda publication but it also undermines the importance of our local press. If the council has information it wishes to share with the public it should be done through local independent sources such as The Star publication or local independent radio, along with advertising of local events that help fund such sources. Fair comment, but FYI staff are good writers. Which prompts the question has the fearless ODT Health Reporter Eileen Goodwin left the Thunderer permanently?